These will not be from my own repertoire as I’ve not been that far North or South yet, but I want to post a big ‘Well Done’ to a mate of mine, Alex Hibbert, and his trekking partner George Bullard for their recent record breaking return traverse of the Greenland ice cap. On July 16th, 113 days and 1374 miles after setting off from the West coast, they were picked up by a chopper and are now recuperating back home. 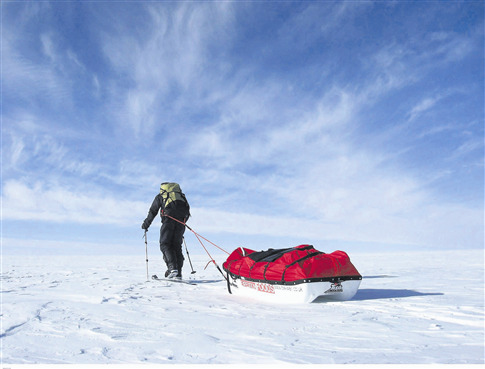 They now have the record for the longest fully unsupported polar trek in history. Pretty neat, I’d say. For starters, there is their age – or rather, lack of it. George is a teenager at 19 and Alex is only 21. Secondly there is the story of knockback behind the attempt – Alex had worked damned hard for the last few years trying to secure funding for two other polar expeditions, each falling through when the money situation wouldn’t work. I would know as he and I studied at Oxford together – same year, same subject, same college. Our dear tutor Dr Iles must have thought he had taken on a bunch of nutters! At least the other 4 in our year have stayed on in academia and are still playing the Biology card. Alex’s determination has been a big inspiration for me, and his guidance very useful in setting up my own plans – so it’s a big well done and a Hughsie thankyou, too. Rest well, boys!